Yes, I get bored of chicken as do you. 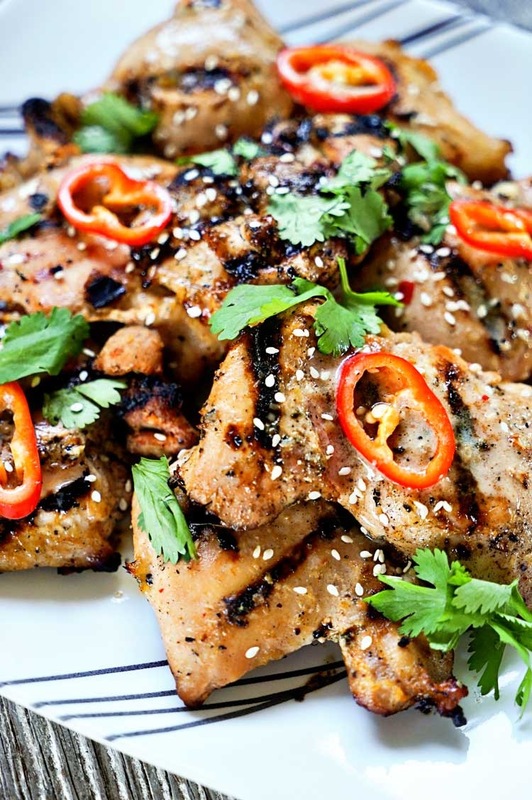 Chicken is a staple protein as I mentioned in my previous blog about the topic. I eat chicken as part of my weekly rotation, and often it’s cooked the same way. However, that’s not to say that you can’t switch it up. What I often do is add 2 different chicken meals to my rotation weekly to keep from getting bored. I have 5 more for the list. These recipes are favourites of mine. If they are not all up your alley, that’s ok. The purpose is to give you some ideas so that you can maybe apply one or two of them to break up the monotony. Also, notice that when you add to a chicken dish, calorically, you often need too take away and that usually means compromising one of your side dishes slightly. That’s Ok. It’s worth it. It’s as simple as it implies. 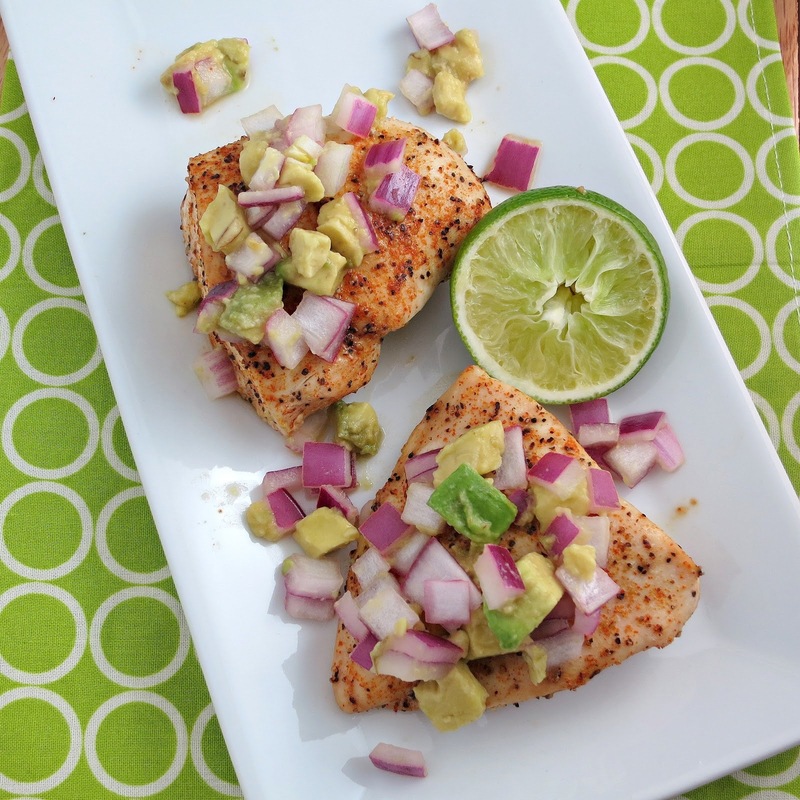 I add a little bit of salt, cayenne pepper, red onion, cilantro, small bits of avocado and fresh line to my chicken. The additional calories really isn’t a lot but the added flavour you get is superb. The other advantage of this dish is that it’s very easy to make. With this dish you can get away with having a small side of carbs like a 1/2 cup of rice. This one is dangerously good. I will preface this one by saying that its a stand alone with a side of steamed vegetables. Secondly, I make this dish with chicken thighs to add to the flavour. Ingredients added to the grilled chicken are: garlic cloves (minced and mashed), lime juice, red chili flakes, a little bit of sesame oil, a touch of brown sugar, a touch of honey, and some pepper. I garnish the chicken after cooking with a few sesame seeds and cilantro leaves. I could eat this dish 2 times per week easily. Again, keep the sides super light. 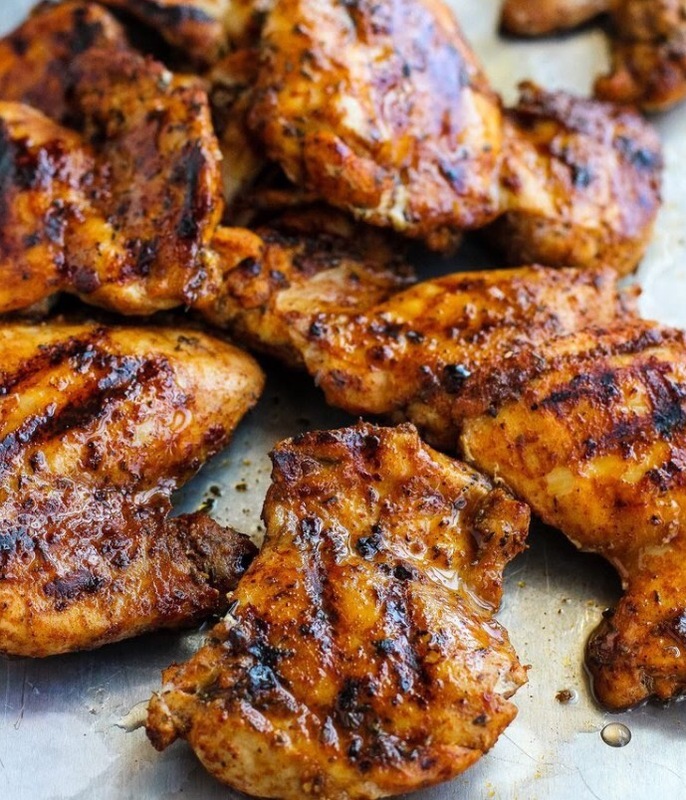 Much like the meal above, chicken thighs are more fatty. I grill these thighs after basting them in bbq sauce. I use garlic powder and Montreal Steak spice. The cautionary tale for this meal…. you are best served with a light side, perhaps a salad with light dressing or steamed vegetables. This is also a great dish for a Refuel meal. Another pro to this dish is that the fat on the chicken adds to your satiety, making you full for the next 3-5 hours before your next meal. Bottom line, this dish is NICE. I took a chance on this one a while back and it really adds a unique flavour with its mix. Really simply, bake your chicken coated with a blend of brown sugar, paprika, salt, pepper, oregano and garlic. 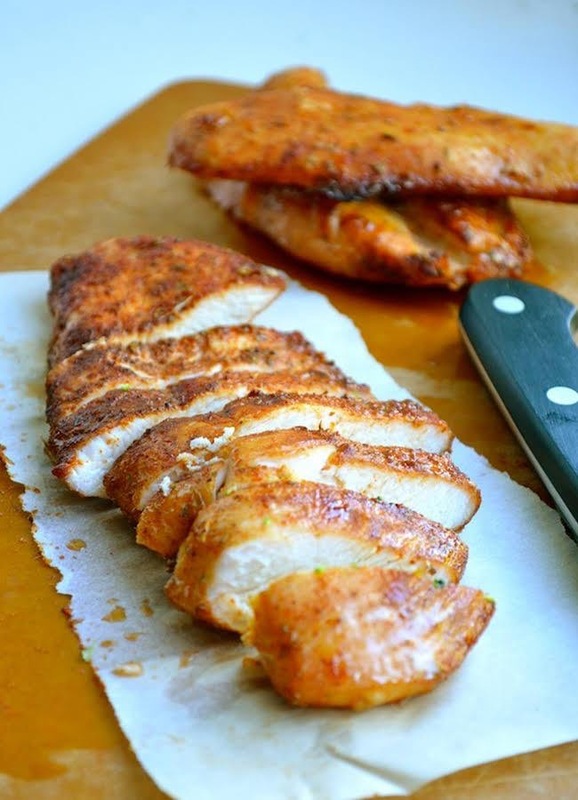 The brown sugar adds a little bit calorie wise but the leanness of the chicken allows for you to have a bigger side. I will often have this with a sweet potato. 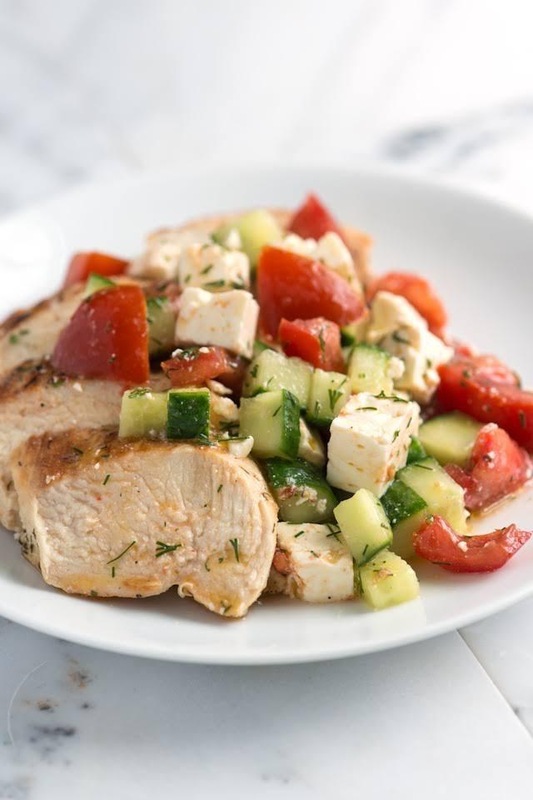 This is a great lunch dish, with your grilled, fried or baked chicken placed underneath a topping of some diced tomatoes, cucumber and a little bit of feta. The feta creates a salty chewy texture while the cucumber and tomato gives some volume to the dish. I add a little bit of lemon and actually use a rice vinegar in place of oil for this one, minimizing the calories in the process. Previous Post Secret to Living is Giving?